Welcome to Casa Leone. 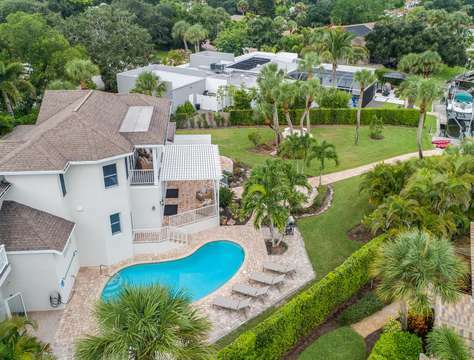 An absolute one of kind, limited edition home located on prestigous Siesta Key featuring an extremely private and lushly landscaped heated pool and hot tub area, near America's #1 Beach, minutes away from Siesta Key Village! It's time for that vacation! And there is no better place that makes you feel like that than our vacation home, Casa Leone! The vibrant, lush landscaping that surrounds it leads you directly poolside where your world is transformed into your own private Caribbean paradise tucked deeply into Florida's jungles! Outside, enjoy the private heated pool and spa, plenty of loungers and seating for dinner parties! Whether it is time to spark up the grill and play some tunes, or a moment that calls for reading a book quietly under the morning light, Casa Leone can deliver all that you want. Inside Casa Leone is a joyful and bright splash of a kitchen and dining area that opens up to living room on the second floor of the home. This common area opens by sliders to a screened in porch that is reminiscent to a tree house vibe, with greenery all around, adding privacy and enhanced ambiance. On this porch, you can dine outside as a family or group with the large dining room table and access to the grill just down the porch stairs. Make the inside become one with the outside by simply opening the sliders and letting your guests roam to what feels comfortable to them. On that same floor are two guest bedrooms, featuring 2 queen beds and bunk bed twins. There is a shared hall bath featuring a walk-in shower just across the way. Upstairs on the third level you will only find the master bedroom and private bathroom. The master bedroom has a King Size bed and features its very own extremely private porch... above the thick jungle treetops and hidden from any other homes around the neighborhood. The privacy and serenity on this third level makes it extremely appealing to lounge and bask under the warm sun, or just cozy up with your beloved under the moonlight. On the ground floor of Casa Leone is the garage (2-car) and a small apartment style suite featuring it's own bedroom with a queen bed, private living room or play room, and a private bathroom, which can also serve as the pool bath as it is on the same floor as the pool. The sliders from the living room give direct access to poolside, but at the same time, it can also serve as a separate entrance and space to tuck yourself away once in a while for a little self-indulgence. Altogether, Casa Leone comfortably sleeps 12 in total, with 4 bedrooms and one pull out sofa that is located in the downstairs apartment suite living room. 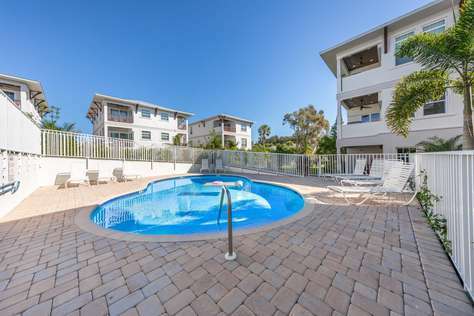 Casa Leone has one of the best locations on the key, as it is only minutes from Siesta Key Main Beach Access and Village as well as only minutes from Downtown Sarasota. Enjoy the limelight of downtown culture, shopping, theatre, restaurants, bars or sit back, relax and catch some rays of sunshine while chilling on America's #1 Beach.... the choice is yours, the world is your oyster! Welcome to the center of it all, Casa Leone! Welcome to our serene vacation home! A cozy beach cottage in a dream destination and in walking distance to the beach. Crescent Cottage offers a vivacious assortment of amenities and its spacious abode is designed to accommodate large families or a getaway retreat. This home has recently been renovated to adjust its charm for a more appealing place to rejuvenate the soul and relax the mind, far from the cares of the world. Vacation begins as soon as you step foot in the doorway with an open floor plan, and a gourmet kitchen featuring granite and stainless steel appliances, and recently updated bathrooms. The bedrooms each have HDTVs and a peaceful atmosphere providing everyone a space to call their own. The home comfortably sleeps 10 altogether, with the master featuring a king size bed and the three guest rooms that feature 1 king, 1 queen and 2 twins. There is also a surprisingly comfortable sofa sleeper. Point of Rocks, located just south of the Stickney Point Bridge, the most notable location on Siesta Key. This area is blessed with the soft, white quartz sand found only on Siesta Key beach, but geologically unique and named for the formation of limestone rock that extends from the beach out into the Gulf of Mexico. This location has become home to a wide array of tropical fish and is not only a great environment for fishing, but the only real location for great snorkeling on the Island. Welcome to Latitude Adjustment! This breathtaking 4 bedroom, 4 bathroom home is perfectly situated between America's #1 beach in the world and Siesta Key's famous North Village! This tropical oasis is covered with vibrant hot pink bougainvillea flower vines and offset by magnificent Florida-style upbeat shades of green, you'll feel as though you are in a Botanical Garden. The location, ambiance, amenities, and decor of this home is nothing less than exceptional in every way. The owners, Lady Flanigan and her family, would have it no other way, and certainly pride themselves on making Latitude Adjustment exactly the experience of which is it known for.... prepare yourself to be swept away into another world... to forget all of your daily grind, stress, and anxiety... this home is for healing and you will feel yourself elated to be there once you arrive. Siesta Key Village is approximately .3 north of this location. A leisure walk will get you there in 7 minutes. Plenty of restaurants, shops and night spots. Breathe in the serenity and peace of The Canal, a waterway that accesses our intracoastal waters along with your own private dock and heated pool. Inside this abundant oasis, you will find enriching decor, ready to energize you and your family to prepare you for all that Siesta Key has to offer. The kitchen is fully stocked, with high quality appliances and every utensil and cooking apparatus sure to make your inner chefs heart sing! Enjoy access to your homes personal beach caddy, chairs, and towels along with bicycles and kayaks to explore this quaint yet invigorating island we call home. Take advantage of this homes private dock and consider bringing your personal boat. If you don't have one, take this opportunity to rent from one our of exclusive Patio Partners - we have everything from daily or weekly pontoon boat rentals for your family, offering fishing and sunset eco-tours with exclusive and phenomenal pricing! Just ask one of our vacation specialists for more insight! There are two balconies overlooking the outdoor pool area that boasts a gas grill and an outdoor dining area that seats 8 (plus additional seating around). While inside, you will truly enjoy being under one roof yet having the opportunity to self indulge with the benefit of 3 separate floors, all easily accessible by the private elevator. The main area or common area on the 2nd flood includes the kitchen, dining, and living room area. There is a guest room that features a king size bed and access to the full bath with an enclosed shower. Just below, on the bottom floor is the perfect apartment style suite, with a queen size bed and combined sitting area also with its own bathroom and enclosed shower. This level offers private entry access from the ground floor and direct access to the pool. Upstairs on the 3rd floor, there is the main master bedroom which features a king size bed with its own private balcony, and a spacious yet sensually appealing master bathroom featuring two sinks, and a dual shower room tucked away for a retreat into your very own oasis. Just down the hall there is a guest room featuring two full beds and yet another bathroom en suite with a gorgeous and expansive layout. Nothing has been spared to make this the most perfect vacation rental. We hope you enjoy. Welcome to Mango Manor! This beautiful and vibrant 4 bedroom, 3 bathroom vacation home accommodates up to 12 people. This home provides a fantastic and unique configuration that allows for large families traveling together to enjoy some well-deserved togetherness as well as a little self-indulgence when the time is right. When reserved this location features a large heated swimming pool and a courtyard surrounded by lush gardens and a tall privacy wall around the entire property. Outdoor amenities also include a gas grill, charcoal grill, beach bicycles, and plenty of beach going equipment, such as a beach caddy and cooler, chairs and towels. Mango Manor is comprised of two separate properties we call Honey Mango and Juicy Mango. Reserved together this home offers diverse bedding accommodations to make it easy for adults and children alike to stay and play! Honey Mango Cabana features a 2 bedroom, 1 bathroom configuration with a king size bed in the master and a queen size bed in the guest room. Juicy Mango Cabana features a 2 bedroom, 2 bathroom configuration, with a king size bed in the master and two twins in the guest room. Both cabanas features sofa sleepers that sleep 2 each, for a total sleep number of 12 in comfort! Uniquely, this home offers two large kitchens, both offering granite countertops, stainless appliances, everything necessary to prepare and serve lavish gourmet meals for a huge group. Two comfortably furnished, expansive living areas offer the opportunity for all to gather in a single room or slip away for a few hours of individual family indulgence, completely your choice. Welcome to Playa y Blanca. This uniquely configured single level home is the combination of two properties named Casita Blanca and Casita Playa. Combined the property has 2 kitchens and 2 living areas creating the perfect arrangement for families or groups that treasure together time but also value privacy. This vacation property features a beautifully landscaped private front and back patio area to include a hot tub for entertaining and relaxing, gated beach access near by, and a communal heated swimming pool with plenty of pool furniture and a restroom facility. After you've caught your breath on our spacious patio, take a short stroll down to our private, gated beach access point and behold the amazing wide expanse of the USA's #1 rated beach with the purest, whitest sand and clearest, azure gulf waters you will ever see. Check in with our beach attendant to enjoy the use of our PRIVATE BEACHFRONT lounge chairs and umbrellas (limited to 2 chairs & 1 umbrella during peak season but no worries, plenty of Tommy Bahama Backpack beach chairs, coolers, and a beach caddy are available at your home away from home!) The beach attendant can also provide you with rentals for ocean kayaks and paddle boards for an hourly fee. Just to the left of our beach access you'll find Point of Rocks, an area rich with coral formations and colorful marine life that is great for snorkeling and fishing. You've already stocked up at the close-by Crescent Market which offers a wide selection of groceries, produce, and fine wine & beer, so after a great day at the beach and/or the pool, throw some fresh fish on the grill (the only fish market on Siesta Key is also only a block away and prepare dinner in our well equipped, stainless steel/granite kitchens. Hop on one of the bicycles alloted with your vacation home or call a free golf cart-style taxi service (tips only) to explore anywhere else on the island you wish to go. This is paradise found, a single sunset from our gorgeous beach will have you hooked and keep you and your family returning to Siesta Key year after year. We look forward to sharing our island paradise with you! Call now to speak to one of our vacation specialists to reserve Playa y Blanca and for more information on how to reserve them separately. Welcome to Seaside Cottage! 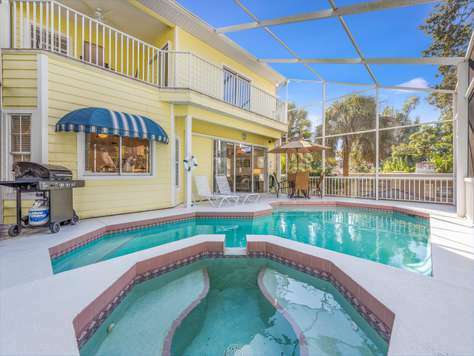 This lovely and rare 4 bedroom 3 bathroom heated pool home has just gone under extensive renovation, leaving a spectacular beach vacation home that rivals most on Siesta Key! As you open the front door, and step into the sparkling clean common area and kitchen, it's time to drop the bags, release your tension and settle in to your perfect vacation home. The kitchen features beautiful cottage-style cabinetry with upgraded granite counters, stainless steel appliances, and a bar that seats 4. Open to the rest of the common area, the kitchen truly is defined as the heart of this home, allowing for maximum entertainment value. The chef will enjoy the new appliances, along with all of the gadgets and supplies one could ask for in a kitchen just like their own. Turn the bar counter into your personal buffet, making large home-cooked meals easy to serve and enjoy! And for larger gatherings, the dining table can extend and seat up to 8 guests at one time. After a great dinner, relax on the couch and watch a little television to begin your down time with a large HDTV flatscreen viewable by all in the common area. If that's not enough comfort, then enjoy the secondary den, with the sofa sleeper and HDTV... perfect setting for the designated "kid's space!" In each bedroom, you will enjoy the plush luxurious comforts of top quality bedding and linens, additional blankets, and brand new furniture and mattresses in each room. The bedspreads are bright and cheerful, exuding true Florida spirit. The pillows are plush enough to fall into every night with linens so soft that o sleep is a dream in itself! Rest comes easily, especially with the comfort of specialized pressure relief mattresses designed to relieve any aching body. The home features three king size beds, one in each bedroom and the "kid's room" has a full/twin trundle that can sleep 3. HDTV flatscreens are wall-mounted in every room. The home sleeps 11 with an extremely comfortable sofa sleeper that boasts an upgraded gel memory foam ultra deluxe mattress in the den. Don't worry! This sofa sleeper is different than all the rest, and will allow for a restful stay for those extra guests who come to visit! The outdoor area is absolutely inspiring with a heated swimming pool, loungers all around for sunbathing, and new outdoor furniture that seats enough for 10. And why not crank up the grill for a family BBQ? The greatest part about this location is that the home is located just across the street from the No.#1 Beach in the US! You're on island time, so soak it all in and bask in your vacation! You will love Seaside Cottage, and you will want to return year after year! Welcome home! Stay sun-drenched and sand-happy, no matter what! Welcome to the Siesta Dream House! If this unit is not available, please contact us for the availability of another comparable one! Hidden within Siesta Key lies a luxurious villa in all of it's splendor. Just after you cross the North Bridge from the mainland in the coveted northern part of the Island, among some of Siesta’s wealthiest homes, lies the charming "Siesta Dream House." This neighborhood is quaint and picturesque, with small roads that remind you of a faraway island retreat, tucked deep into the luscious and ever-growing Florida landscape with towering palms, birds of paradise, and blooming vines wrapping around every home. This brand new tri-level home has been completely redecorated to capture the true essence of living the luxurious Florida lifestyle. No expense was spared to create this simple haven of elegance, with a heated pool and spa surrounded by a lush tropical backdrop. Perfect for a family of 12, this home boasts two masters (king size bed in each), and kids will truly enjoy having their own little playroom with 4 specially designed twin bunks and nooks, all on the 3rd level. The main master bedroom has a bathroom en suite. The secondary master shares a full bathroom with the kid's room. On the 2nd level, you'll find another guest room with a queen size bed, a full bath en suite, along with a secondary living room/game room area with a queen size sofa sleeper. This becomes the perfect area to retreat and find some time for self-indulgence, while the rest of your group can relax on the main floor with a full gourmet chef's kitchen open to an expansive living room, full dining and an additional study area. There are two french doors that open to the screened in lanai that overlooks the gorgeous gardens where a heated swimming pool and spa have been tucked away in privacy. Every amenity is at your fingertips, from the pool and spa, to the bicycles in the 2-car garage. There's no better way to explore our exquisite key than to walk or bike... and just down the road by two blocks, you can find your first beach access called Shell Road. Why not stop there with the beach caddy, cooler and chairs that are provided, and enjoy the sun setting over the Gulf of Mexico. Take a dip in the water to recharge your spirit, and energize your soul! This is the vacation you have been waiting for! Welcome to Sol y Mar. This COMPLETELY RENOVATED, single level and uniquely configured (4 BR/2BA - 2 Master BR/1 Queen each & 2-2nd BR's w/2 twins each-sleeps 8) vacation home [Casita Mar and Casita Sol] has 2 kitchens and 2 living areas, the perfect arrangement for families or groups that treasure together time but also value a bit of privacy. This vacation property features private, gated beach access, a sparkling clean hot tub in a private, lush setting, a communal heated swimming pool with plenty of pool furniture and a bathroom, as well as beautifully landscaped private front and back patio areas for entertaining and relaxing. Too relaxed to cook? Rinse off in the outdoor shower and just head down the street to any number of casual or fine dining restaurant options (Captain Curt's, Clayton's, The Toasted Mango, Ophelia's, Turtle's, Anna's Deli just to name a few!) or maybe enjoy a margarita while listening to live music in the thatched hut Sneaky Tiki! Hop on one of the bicycles that comes with your vacation home or call a free golf cart-style taxi service (tips only) to explore anywhere else on the island you wish to go. This is paradise found, a single sunset from our gorgeous beach will have you hooked and keep you and your family returning to Siesta Key year after year. We look forward to sharing our island paradise with you! Welcome to “Villa Champagne”, one of the most fabulous vacation homes in Siesta Key. It’s also one of the most popular favorites among our many guest families. The magic begins as you enter the foyer of this beautiful villa and gaze across the expansive living area, then further out across the screened in swimming pool and spa and deck area, through the huge surrounding 100 year old Oak trees, and finally onto the Grand Canal of this waterfront home. Villa Champagne offers four (4) bedrooms and three and one/half (3.5) bathrooms as well as a gorgeous gourmet kitchen. An expansive dining room that seats 10 with the wrap around bar offers plenty of dining space for everybody. This villa easily accommodates 8 adults (including children) sleeping in various bed configurations. Upstairs you’ll find a master bedroom with a King-size bed, an ensuite full bathroom, private outside deck and lovely furnishings. The second bedroom features a queen bed, nice furnishings and an adjacent full bathroom. Bedroom three features two twin beds and cute beach style beautiful décor. Another full bathroom separates the fourth bedroom which features a queen size bed and very nice furnishings. Experience Siesta Key By Water, you can tie your boat up to the dock or arrange a pontoon boat rental from “The Black Pearl” (exclusive to our guests only!) for a portion of the week. We’ll be happy to assist. If you have interest, just let one of our reservationist know during your booking, and they can give you more information. You know already you made the right choice for your family and friends. The enchantment of “Champagne” is just beginning. Soon the smell of salt air and the laughter and joyful sounds of family will supplant the stress of workdays and wash away the doldrums of everyday life back home. You’ve truly found your own little slice of heaven. Outside the villa you find an enormous number of features to make life truly enjoyable. Abutting the heated swimming pool you’ll find a relaxing spa shaded by one of the huge Oaks on the property. The pool and spa are enclosed in a protective screened lanai to provide mosquito free enjoyment. Strolling through the lushly landscaped property, you find three (3) kayaks available to explore the canal system. At night you’ll quickly become mesmerized by the underwater snook lights that draw so many large fish right to you and soon you will be readily become addicted to fishing off the waterfront dock. It’s great fun for everybody. The Nation’s Number One beach is a quick block and a half stroll up the street, within easy walking distance. But for longer distances, you’ll find plenty of bikes in the garage. Everything necessary to have a great festive vacation lies at your fingertips. Your most formidable and difficult task will be leaving “Villa Champagne” and Siesta Key at the end of your stay. But you’ll make great memories here and I’m sure you will look forward to your return. Siesta Key Village is approximately 1 mile north of Avenida Del Mare. A leisure walk will get you there in 15 minutes. Plenty of restaurants, shops and night spots. Florida is known for its beaches, climate and foliage so this home features on its grounds an amazing amount of lavish tropical foliage to include many flower species as well as many fruit tree varieties. If you like plants and nature, you’ll love the grounds [almost like a botanical garden]. This stunning four-bedroom/three-bathroom luxury villa features a spacious kitchen and living area, outdoor patios & private heated outdoor pool with cabana room. With modern and coastal decor throughout, you will truly be living “the beach life.” Casa Eulimia is located just steps from Crescent Beach & minutes from Siesta Key Beach, voted the # 1 beach in the USA! This home is ideal for large families & groups. This upscale four-bedroom/three-bathroom luxury condo features a spacious kitchen and living area, outdoor patios & private heated outdoor pool with cabana room. With modern and coastal decor throughout, you will truly be living “the beach life.” This home is ideal for large families & groups of 12. Welcome to Casa Mahalo! Our newly constructed luxury cottage (completion date of June 2017) has all the amenities your large group [up to 12!!!] can fathom. The location is THE premier location in the heart of Siesta Key Village, just behind Gilligan's and Lelu's Coffee Shop! Inside you’ll enjoy contemporary porcelain wood style flooring throughout the entire three-story building, an elevator to access each landing from the ground floor, gorgeous and decadent over-sized bathrooms, new appliances, washer/dryer, quartz counters and state of the art stainless steel appliances in the kitchen, and two verandas offering breathtaking views of your very own private pool along with many other great amenities. Downstairs, enjoy your very own private cabana pool side that boasts lounging for your group as well as an outdoor refrigerator, barbecue grill, and a wall mounted HDTV for your favorite sports! The over-sized garage comes complete with bicycles, beach chairs, a cooler and beach caddy so that your three minute walk to our pristine beach is truly effortless. Casa Mahalo has 4 bedrooms and 3 bathrooms with its own heated pool and private cabana just a moments walk to Siesta Key Beach. Perfect for larger parties celebrating family reunions, weddings, special anniversaries, and more. There are 2 bedrooms with King beds and 1 Chair Sofa Sleeper (sleeping 3 in each room) and 1 bedroom with a King (sleeps 2) and 1 bedroom with a Queen (sleeps 2). Enjoy a plush and comfy Queen sofa sleeper in the living room (sleeps 2). Casa Mahalo sleeps 12 with maximum comfort because of its open and spacious floor-plan. The laundry room features a washer and dryer to ensure you have an abundance of clean clothes and towels. Plenty of bicycles and beach paraphernalia are available for your enjoyment and located in the garage. If you are feeling adventurous, you can walk right on over to the main village or hop on the bikes for a quick ride to explore explore the south end of Siesta Key. Crescent Village is but a couple of miles away, and it is a smaller version of the main Siesta key Village! Lots of shops, restaurants, and bars to stop in and enjoy! Casa Mahalo holds THE premier location, with close proximity to Siesta Key’s the #1 Beach in America and in the heart of the famous Siesta Key Village, just behind Lelu's and Gilligan's right along many other restaurants, shopping, entertainment and Nightlife. Welcome to Casa Ohana! Our newly constructed luxury cottage (completion date of June 2017) has all the amenities your large group [up to 12!!!] can fathom. The location is THE premier location in the heart of Siesta Key Village, just behind Gilligan's and Lelu's Coffee Shop! Inside you’ll enjoy contemporary porcelain wood style flooring throughout the entire three-story building, an elevator to access each landing from the ground floor, gorgeous and decadent over-sized bathrooms, new appliances, washer/dryer, quartz counters and state of the art stainless steel appliances in the kitchen, and two verandas offering breathtaking views of your very own private pool along with many other great amenities. Downstairs, enjoy your very own private cabana pool side that boasts lounging for your group as well as an outdoor refrigerator, barbecue grill, and a wall mounted HDTV for your favorite sports! The over-sized garage comes complete with bicycles, beach chairs, a cooler and beach caddy so that your three minute walk to our pristine beach is truly effortless. Casa Ohana has 4 bedrooms and 3 bathrooms with its own heated pool and private cabana just a moments walk to Siesta Key Beach. Perfect for larger parties celebrating family reunions, weddings, special anniversaries, and more. There are 2 bedrooms with King beds and 1 Chair Sofa Sleeper (sleeping 3 in each room) and 1 bedroom with a King (sleeps 2) and 1 bedroom with a Queen (sleeps 2). Enjoy a plush and comfy Queen sofa sleeper in the living room (sleeps 2). Casa Ohana sleeps 12 with maximum comfort because of its open and spacious floor-plan. The laundry room features an washer and dryer to ensure you have an abundance of clean clothes and towels. Plenty of bicycles and beach paraphernalia are available for your enjoyment and located in the garage. Casa Ohana holds THE premier location, with close proximity to Siesta Key’s the #1 Beach in America and in the heart of the famous Siesta Key Village, just behind Lelu's and Gilligan's right along many other restaurants, shopping, entertainment and Nightlife. Welcome to Casa Antilles! Our newly constructed luxury cottage has all the amenities your large group [up to 12!!!] can fathom. Inside you’ll enjoy contemporary porcelain wood style flooring throughout the entire three-story building, an elevator to access each landing from the ground floor, gorgeous and decadent over-sized bathrooms, new appliances, washer/dryer, quartz counters and state of the art stainless steel appliances in the kitchen, and two verandas offering breathtaking views of your very own private pool and the Point of Rocks community among many great amenities. Downstairs, enjoy your very own private cabana pool side that boasts lounging for your group as well as an outdoor refrigerator, barbecue grill, and a wall mounted HDTV for your favorite sports! The over-sized garage comes complete with bicycles, beach chairs, a cooler and beach caddy so that your three minute walk to our pristine beach is truly effortless. Casa Antilles has 4 bedrooms and 3 bathrooms with its own heated pool and private cabana just a moments walk to Point of Rocks Beach. Perfect for larger parties celebrating family reunions, weddings, special anniversaries, and more. There are 2 bedrooms with King beds and 1 Chair Sofa Sleeper (sleeping 3 in each room) and 1 bedroom with a King (sleeps 2) and 1 bedroom with a Queen (sleeps 2). Enjoy a plush and comfy Queen sofa sleeper in the living room (sleeps 2). Casa Antilles sleeps 12 with maximum comfort because of its open and spacious floorplan. The laundry room features an over-sized washer and dryer to ensure you have an abundance of clean clothes and towels. Plenty of bicycles and beach paraphernalia are available for your enjoyment and located in the garage. Welcome to Casa Coquina! Our newest luxury cottage has all the amenities your large group [up to 14!!!] can fathom. Inside you’ll enjoy contemporary porcelain wood style flooring throughout the entire three-story building, an elevator to access each landing from the ground floor, gorgeous and decadent over-sized bathrooms, new appliances, washer/dryer, quartz counters and state of the art stainless steel appliances in the kitchen, and two verandas offering breathtaking views of your very own private pool and the Point of Rocks community among many great amenities. Downstairs, enjoy your very own private cabana pool side that boasts lounging for your group as well as an outdoor refrigerator, barbecue grill, and a wall mounted HDTV for your favorite sports! The over-sized garage comes complete with bicycles, beach chairs, a cooler and beach caddy so that your three minute walk to our pristine beach is truly effortless. Casa Coquina has 4 bedrooms and 3 bathrooms with its own heated pool and private cabana just a moments walk to Point of Rocks Beach. Perfect for larger parties celebrating family reunions, weddings, special anniversaries, and more. Once inside the home, you will see that Casa Stolida is the definition of Siesta Key living. With coastal décor and brand-new furnishings throughout; you will truly feel like a Siesta Key local! Casa Stolida is ideal for large families and groups. Welcome to Casa Tegula! Our newly constructed luxury cottage has all the amenities your large group [up to 12!!!] can fathom. Inside you’ll enjoy contemporary porcelain wood style flooring throughout the entire three-story building, an elevator to access each landing from the ground floor, gorgeous and decadent oversized bathrooms, new appliances, an oversized washer/dryer, quartz counters and state of the art stainless steel appliances in the kitchen, and two verandas offering breathtaking views of your very own private pool and the Point of Rocks community among many great amenities. Downstairs, enjoy your very own private cabana pool side that boasts lounging for your group as well as an outdoor refrigerator, barbeque grill, and a wall mounted HDTV for your favorite sports! The over-sized garage comes complete with bicycles, beach chairs, a cooler and beach caddy so that your three minute walk to our pristine beach is truly effortless. Casa Tegula has 4 bedrooms and 3 bathrooms with its own heated pool and private cabana just a moments walk to Point of Rocks Beach. Perfect for larger parties celebrating family reunions, weddings, special anniversaries, and more. There are 2 bedrooms with King beds and 1 Chair Sofa Sleeper (sleeping 3 in each room) and 1 bedroom with a King (sleeps 2) and 1 bedroom with a Queen (sleeps 2). Enjoy a plush and comfy Queen sofa sleeper in the living room (sleeps 2). Casa Tegula sleeps 12 with maximum comfort because of its open and spacious floorplan. Welcome to Topsail! Our newly constructed luxury cottage has all the amenities your group [up to 12] can fathom. Inside you’ll enjoy travertine flooring throughout the entire three-story building, garden soaking tub in the master, new appliances, oversized washer/dryer, granite countertops, and five patios so you’ll never miss the perfect view. The over-sized garage comes complete with bicycles, beach chairs, a cooler and beach caddy so that your three minute walk to our pristine beach is truly effortless. This home has state-of-the-art technology that will revolutionize the way you’ll vacation. From the front-entry camera to the elevator, every part of this home was designed to spoil its inhabitants. On the first floor (above the garage) are the open-designed kitchen and living areas, along with one bedroom that shares a common bathroom with the main floor. This bedroom has a king size bed (sleeps 2) and access to the patio that wraps around toward the dining room. This grand patio is where a lot of your time will be spent enjoying the gorgeous weather that Florida has to offer, all the while grilling and entertaining your heart out. You could even wave down to the rest of your party as they delight in the Clubhouse amenities- complete with kitchenette, indoor dining area, shared heated pool, and two restrooms that include showers. The dining room has seating for 8 while an additional 7 stools sit belly-up to the open kitchen bar counter. All utensils are provided including serving platters and prepping tools, as well as a Keurig for those coffee enthusiasts in the group. The living room is cozy and sleek- complete with a fold-out queen sized bed [sleeps 2] from the soft leather couch. When you’ve had enough fun outdoors, the cushy chairs make viewing the 65” HDTV very relaxing. On the second floor are the remaining three bedrooms, as well as another private patio that accesses the spiral staircase up to the rooftop deck- from which you can actually see the crystal blue waters of the Gulf of Mexico. Watch the stars, catch some sun, and breathe the salty air until your stress fades away. Speaking of luxury, this master bedroom needs no introduction. If you desire separate sinks, a soaking tub, and a king sized bed [sleeps 2] then this is your haven. From the furnishings to the linens, comfort and relaxation await you. The remaining two bedrooms are truly stunning with their own travertine and granite bathrooms, king sized beds, flat panel HDTVs, and extra large closets for those who just can’t seem to pack light... The master and one of the upstairs bedrooms have additional pull-out, twin sleeper beds as well [sleeps 1 each]. Simply bring a toothbrush for this turn-key style experience that only Siesta Key can offer. Beach Towels are located in 1st floor bathroom's linen closet. Villa Brisa Marina or “Sea Breeze” is an exciting 4BR/4BA/2Kit home on our boutique collection of fine vacation homes and it’s sure to be a standout. This home features a brand new heated pool and a four minute walk to the Nation’s finest beach [no major streets to cross]. It’s perfect for families or groups up to 12, especially those families who love to travel together or visit the vacationing grandparents. Villa Brisa Marina offers the unique ability to gather everyone together while also reserving your own opportunity to enjoy your family’s privacy as well. Each of the two Casitas [Sea Wave and Sea Shell] in Villa Brisa Marina which are connected by a common entry lanai, combine to offer two master bedrooms with king size beds (sleeps 4) with private baths, two second bedrooms or four twins (sleeps 4) and two separate living rooms with two very comfy, queen size sofa sleepers (sleeps 4) which share two bathrooms, all of which combine to sleep a total of 12. Four bathrooms in total are available to guests. Villa Brisa Marina offers two full, well equipped kitchens to allow limitless dining possibilities. The overall décor is tastefully done and reminiscent of the seashore with waves and sea shells. And it’s clearly one of our best. Wood floors with soft tropical wall colors, leather couches, and flat panel wall-mounted TV’s that abound everywhere [all bedrooms and living areas] make visiting Villa Brisa Marina such a joy for your family and friends. Two private porches with seating await your quiet reflective moments. Two full sets of washers and dryers are available as well. Outside you’ll find 4 bicycles and beach equipment and your private designated parking for up to four vehicles. The lavishly lush tropical landscaping, up-lighted for special effects at night immediately reminds you of exactly why you came to Siesta Beach, our tropical paradise. 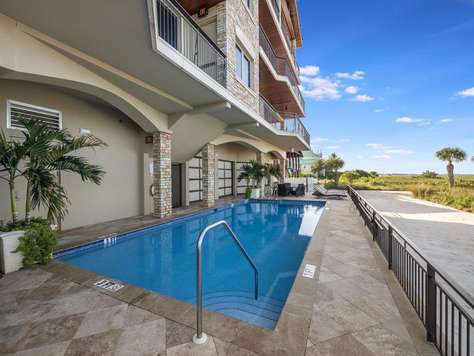 As you sit by the pool in the warm sun relaxing, you’ll struggle with the decision to go down to the Nation’s number 1 beach or perhaps to the south village area, all within easy walking or biking distance of Villa Brisa Marina. As you may already know, Siesta Key’s beach offers some of the finest, purest white quartz sand found anywhere in the world. Rated number one in the nation, you’ll soon discover why you’ll always want to return to Siesta’s fabulous shoreline. The South Village offers a convenient grocery store with a great butcher shop, boat and kayak rentals, ice cream shops, outdoor casual dining and entertainment venues and truly some of the finest restaurants on Siesta Key. And if you choose to go anywhere else on the Island, a system of free taxi’s [extended surrey top golf carts – tips only] are available on your request. Villa Brisa Marina is a truly unique vacation home that you, your family and friends will love returning to year after year. 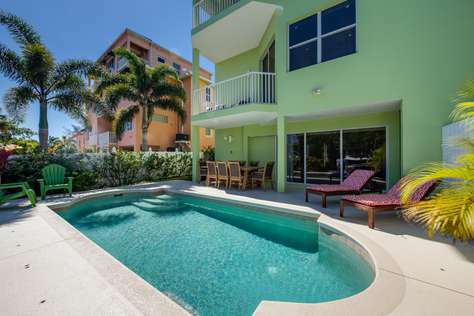 Villa Dom Brisa is a beautifully decorated 4 bedroom, 4 bathroom, 2 kitchen home located on Crescent Street in South Siesta Key. This home is part of the Las Brisa complex of two beautiful 4-BR homes offering unique sleeping combinations to larger groups or families traveling together. Combine Villa Dom Brisa with Villa Brisa Marina to sleep up to 24 - a unique vacation home opportunity on Siesta Key and all within the Las Brisa compound. When booked together, Villa Dom Brisa features a brand new private heated pool (when booked separately, the pool is shared between the two units). The décor is beautifully done and so reminiscent of the seashore with starfish and the reef [found only in the Point of Rocks area] themes. It’s clearly “beachy” but luxurious here. Each of the two Casitas [Coral Reef and Starfish] in Villa Dom Brisa, are connected by a common entry lanai and combine to offer two fully equipped brand new kitchens allowing limitless dining possibilities. As you might expect Villa Dom Brisa is truly a decorator’s dream offering beautiful wood floors enhanced with tropical wall colors and white trim. Sleeping accommodations for 12 are provided with two master bedrooms with king size beds (sleeps 4) and private baths. Two second bedrooms with a total of four twins (sleeps 4) and two separate living rooms with two queen size sofa sleepers (sleeps 4) share two additional bathrooms. Leather couches, beautiful new décor and flat panel, wall-mounted TV’s abound everywhere [all bedrooms and living areas] make visiting Villa Dom Brisa such a joy for your family and friends. Fine linens, towels including beach towels and everything else are truly “first class” here. Everything you need for a wonderful experience is here. Outside you’ll find 4 bicycles and beach equipment and private parking for up to four vehicles. The lush, tropical landscaping up-lighted for special effects at night immediately reminds you of your attraction to Siesta Key Beach, our tropical paradise. Outside private porches and seating are available for those quiet moments you sometimes need or reading if you can find the time. Dual sets of washers and dryers are available in the home. As you sit by the pool in the warm sun relaxing, you’ll struggle with the decision to go down to the Nation’s number 1 beach or perhaps to the south village area, all within easy walking or biking distance of Villa Dom Brisa. Villa Dom Brisa is a truly unique vacation home that you, your family and friends will truly enjoy, and sure to be your choice returning year after year. As you may already know, Siesta Key’s beach offers some of the finest, purest white quartz sand found anywhere in the world. Rated number one in the nation, you’ll soon discover why you’ll always want to return to Siesta’s fabulous shoreline. ​Siesta Key Public beach is about 2 miles north on Midnight Pass Rd and provides parking capability for 800 cars along with restrooms, etc.And you can walk to it right on the beach as well. Siesta Key’s North Village is 2.8 miles north and is always a lot of fun with many restaurants, shops, and attractions. The city of Sarasota is filled with restaurants, art galleries, museums, shopping opportunities, theaters, etc., and offers much to do and see. Two full size laundries inside the home assure you an abundance of clean clothes and towels. Plenty of bicycles and beach paraphernalia to include snorkeling gear are available for your enjoyment and located in the garages. Also there’s plenty of parking available also. Within walking distance [most less than ¼ of a mile] you’ll find all of the great shops, markets, bars and restaurants located in the South Village-Crescent Beach area. Here you’ll find the Crescent Beach Grocery, a gourmet market that features one of the best butcher shops in Sarasota as well as an amazing wine selection. “Big Water Fish Market” located in the Crescent Beach shopping plaza at 6641 Midnight Pass Road is the only fish market available on Siesta Key. “CBs Bait and Tackle Shop” at Stickney Point Bridge offers both fishing tackle, fishing guides and boat rentals. Welcome to Buccaneer's Hideaway! Tucked away in this pirate's hidden cove, you will find a tranquil retreat that will soothe your soul and revitalize your life's passion for finding your next treasure! Sometimes life's high seas can take their toll on you, and escaping to your private cove for rest and relaxation is in order. If the pirate in you is restless and in need of a gentle breeze, warm sun, and a soft place to rest your weary head, you have found the right place. Buccaneer's Hideaway is a stunning 4 bedroom, 2.5 bath home that boasts a very private backyard with a heated pool, screened in lanai, a dock and canal that leads straight to your heart's home... the Gulf of Mexico via the Intracoastal Waterway. Bring your boat, your fishing tackle, and even your finest mateys' to experience this beautiful scenery and excellent location only minutes from the #1 Beach in the US, Siesta Key. Grill out by the pool under the night sky, or take a break down by the dock on the bench and watch the fish jump, egrets drop in and ospreys soar by with a fresh catch in their talons. Don't be surprised by daily visits from our friendly manatee looking for fresh water to drink! Hop in the canal by way of kayaks and investigate the surrounding waterways with this peaceful yet wild habitat. No sense of urgency and the hustle and bustle doesn't exist here... this environment is safe for all ages to explore with only friendly critters to gaze upon and watch in excitation. Buccaneer's Hideaway is nothing short than ARRRR-mazing!!! So come aboard, land and sea lovers alike! Casa Antigua is a four (4) bedroom, two (2) bath private home. It is configured for maximum comfort and enjoyment for large parties who will find it a well designed retreat and haven to call your own vacation home. 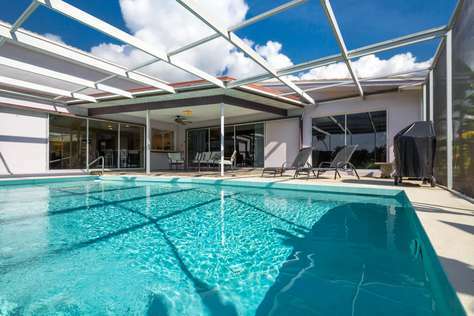 First and foremost, enjoy the benefits of your very own heated swimming pool and breeze. There are bicycles provided for an afternoon adventure.. Since we are in the heart of Sarasota, why not take some time to explore our city in all of its greatness? Biking through Gulf Gate is safe and convenient with direct access to the well known 20 mile long biking and walking trail known as the Legacy Trail. When it’s time to retire to the bedrooms, everyone enjoys their personal space with plush clean bedding, exceptional pillows, HDTV in every room, and space for personal time and restful slumber. In the master, there is a king size bed (sleeps 2), and three additional guest rooms. One features a king size bed (sleeps 2), the second features a queen size bed (sleeps 2) and finally, the third feature twin bunk beds (sleeps 2). There are two bathrooms and lavish towels are plentifully provided. There are lots of oversized beach towels available as well. 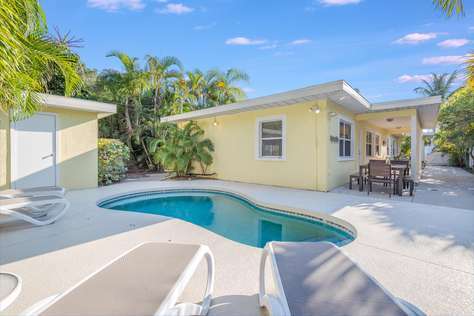 Centrally located in the heart of Sarasota only minutes away from our world famous Siesta Key Beach, Casa Antigua offers a bright and cheerful retreat with a heated swimming pool and tropical landscaping. 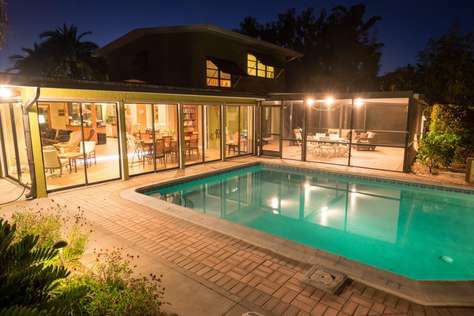 Perfect for larger parties that enjoy the peaceful serenity of their own private sanctuary with beautiful vistas, who love the closeness to not only Siesta Key, but the nightlife of Southside Business District and Downtown Sarasota. Siesta Beach, one of the world’s finest [rated No. 1 by TripAdvisor in 2015] is approximately 5 miles away west off of Stickney Point Dr. You’ll love its crystal white quartz sand which remains cool in the summer and fine to the touch. It’s rare to find a fantastic vacation home on the mainland so close to the key. Excellent facilities are available at the main beach access and includes lifeguards, volleyball, morning exercise sessions, bathrooms, tennis, concession stand, bathrooms and plenty of parking. It is within easy driving distance and a beach cooler with plenty of beach chairs and beach towels are provided at Casa Antigua for an easy day at the beach. Siesta Key Village is approximately 5.5 miles from Casa Antigua. A leisure drive will get you there in 10 minutes. Plenty of restaurants, shops and night spots! Florida is known for its beaches, climate and foliage so this home features on its grounds an amazing amount of lavish tropical foliage to include many flower species as well as many fruit tree varieties. If you like plants and nature, you’ll love the grounds [almost like a botanical garden]. The waterfront cottage, ‘La Casa Verde’ is a very luxurious and large four  bedroom canal front heated pool home with two very large bathrooms in approximately 2,800 square feet of air conditioned living space. As you approach the home you are immediately drawn into it by volumes of lush, lavish tropical foliage just as you envisioned your Florida experience would be. Colorful seasonal flowers border both sides of the walkway entering the home and you soon find yourself beaming with happiness. You immediately notice the huge, spacious living room with high, voluminous ceilings and an enormous travertine fireplace. Original artwork abounds. Across the open entry and stepped down dining area, you look out beyond a wall of glass into the pool courtyard featuring lush, green tropical landscaping and flowers, all completely surrounded 180 degrees by the canals. You are simply amazed. Water, water everywhere…. Once inside, just off to your left, the home offers a beautiful and expansive kitchen with stainless steel appliances, granite counter tops and everything necessary to prepare your favorite gourmet meals. And most importantly, the entire kitchen opens up to the great room allowing everyone to be together in a wonderful family gathering. Downstairs, the master bedroom features a comfortable queen size bed and a guest room with two twins that can be converted to a king bed. There is a beautiful and spacious tile bathroom with a steeping tub-shower combination, marble counter tops, and tile floors. Upstairs you find an enormous sleeping loft with hardwood floors and three twin beds abutting another large master bedroom with a king size bed. The upstairs conjoined master bath features an oversized shower with twin individual sinks for your added convenience. There is an abundance of closet space and furnishings. Plenty of flat panels TVs are available for your enjoyment as well. Outside, you’ll enjoy the huge pool surrounded by lush landscaping, flowers, beautiful landscape up lighting at night creating a magical pool environment. Underneath the big tree you’ll discover a truly inspiring hammock along with a special place for two, the overlook deck. Here you’ll sit and sip a glass of wine under the tree in a very private, special setting while gazing onto the canal or perhaps the snook light later in the evening. And there is always a cool breeze to enjoy. ​Off to your right, you’ll find the dock, plenty of colorful adirondack chairs and a great place for fishing at night at the snook light. During the day, it’s the launching site for the kayaks that are there onsite and great fun for touring the neighborhood by water. You can also tie your boat up to the dock or arrange a pontoon boat rental from “The Black Pearl” (exclusive to our guests only!) for a portion of the week. We’ll be happy to assist. If you desire to explore the island, head to the beaches or just get some exercise, plenty of beach cruisers  await you in the garage. You simply will never run out of fun, family activities at the canal front ‘La Casa Verde’. There is a 1 rental per 30 day period, per Sarasota, FL ordinance, contact us for more information. Excellent facilities are available at the main beach access which is but a mile away and includes lifeguards, volleyball, morning exercise sessions, bathrooms, tennis, concession stand, bathrooms and plenty of parking [800 spaces and more coming]. Siesta Key Village is just one block away. A leisure walk will get you there in 2 minutes. Plenty of restaurants, shops and night spots. Florida is known for its beaches, climate and foliage so this home features on its grounds an amazing amount of lavish tropical foliage to include many flower species as well as many fruit tree varieties. If you like plants and nature, you’ll love the grounds [almost like a botanical garden]. With an absolutely unbeatable location, this fabulous home is only two blocks to the world famous Siesta Key Beach, and just an easy and quick bicycle ride to the Village. Feel free to walk, bike or take free taxi rides wherever you go on Siesta, as you are but moments away from all great activities, sights, restaurants and shops! Don't forget to take a day to explore the beautiful city of Sarasota which offers world-class restaurants, side walk cafes, theater, art galleries, opera, museums, specialty shops, boutiques and nightlife, all within just a short 15 minute drive. Everyone will enjoy the heated pool with cascading stairs that lead to the sparkling blue waters, and a soothing hot tub with breathtaking views of the waterway. Enjoy the adventures that come with having access to 2 Kayaks for exploring the canals, bicycles  for happily meandering around the entire island and experiencing the beautiful neighborhoods first and. Get ready to take advantage of the short distance to the beach (spending every day there sounds like paradise), the outdoor gas grill for big family BBQs, a lavish outdoor terrace for relaxing and dining, and the underwater snook light bringing hundreds of fish right to the canal edge every night, terrific for fishing right off the property at night. We invite you to come and stay at Sea the View, and experience this perfect destination getaway home for yourself. You will immediately fall in love with Siesta Key, and all this unique island has to offer, and we are sure you will return year after year! Welcome to Sea the View! Enjoy the decadence of multiple master bedrooms, three of which feature king size beds and en suite bathrooms. The fourth bedroom features twin over full bunk beds which makes it the perfect setup for parents who prefer to have their young kids close and a separate space to call their very own, almost as if they have a wing of the home! This spacious floor plan and elegant design makes a family of 9 feel comfortable under one roof! Don't forget to open those pocket slider doors in the living room, and let the outside in... The pool lanai feels so private with a wall of lush and tropical landscaping, and plenty of space between neighbors. 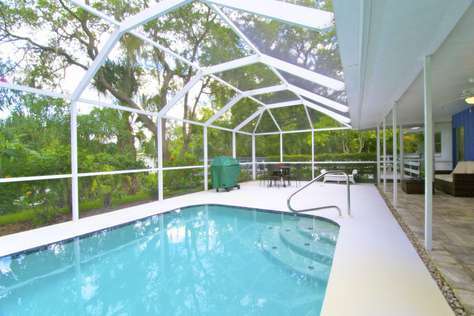 The pool is enticing with a light blue tone and is heated for your personal enjoyment on cooler Florida winter nights. If your family loves to cook and eat, you will be delighted by the state of the art kitchen and gas grill at your disposal. Stainless steel high end appliances along with spacious counters and decadent cabinetry. Dine inside or out at your leisure with plenty of tables to choose from, and don't forget to make a day of it poolside with family games, a perfect BBQ, and fun for all. Everything is at your fingertips! When you get a chance, take a stroll through the neighborhood as it boasts some of the oldest trees on the island. It has been designated as a canopy street, which means the jungles of Florida have not lost their luster on this hidden secret neighborhood. There are also bicycles on property, making it easy to get around town, as you are only but minutes away from Siesta Key Village and the main beach access! Best of all... grab the beach chairs in the garage, head to one of the beach entrances, sink your toes into our powdery white sand and enjoy sunset on Siesta Key. Welcome home! Welcome to the recently renovated Palms Cottage, a gorgeous and expansive 4 bedroom, 2 bath home with its own private heated pool and spa, just minutes from our world famous Siesta Key Beach Access. Driving up to the home, you will see a quaint and cheerful buttery yellow home as the backdrop to the lush vibrant landscaping. Come on in, and across the airy and open living area and dining room, you look out beyond into wall of glass sliders that boasts the sunny exterior lanai featuring an enclosed heated swimming pool and jacuzzi surrounded by lush, lavish tropical landscaping making it an ideal private setting. Back inside, the home offers a completely renovated gourmet kitchen with stainless steel appliances, granite counter tops with soft sage accents, seating in the breakfast nook for 4, and everything necessary to prepare your favorite gourmet meals. Just off the kitchen is a Florida style "mud room" that houses all of the fun stuff and amenities such as beach towels and chairs, bicycles, etc. as well as a laundry area. Just passed this is a quiet and private bedroom that sleeps 2 (queen bed) with its own separate entry and access to the kitchen, making it a great dwelling for the extended family members. The master bedroom is next to the living room, with its own private bathroom, and a king size bed that sleeps 2. The other guest rooms are across the home featuring a queen size bed in one (sleeps 2), and 2 twins in the other (sleeps 2), with a shared bathroom. The living room features a brand new sofa that sleeps 2 in a pinch, with an upgraded top of the line gel memory foam mattress to maximize the level of comfort. With an open and airy feel, neutral tile floors throughout and walls and accents of blue and greens, the home feels like your oasis by the sea. Refreshing, clean, and truly welcoming to come home too. 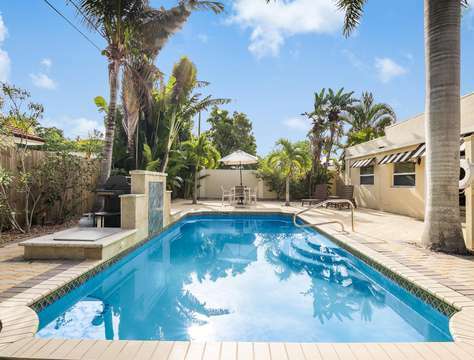 Enjoy the poolside, with lots of seating with loungers and an outdoor table for eating and a view of the canal with gorgeous mangroves and sea grape trees providing privacy and a feeling as if you are in the midst of a nature preserve of your very own. For those interested in enjoying a little time off the beach, The Palms Cottage features a lovely poolscape bounded by a large trees, mangroves, sea grapes, and a view of the canal while offering comfortable seating/lounging under a screened in lanai. Four bikes await your urge to explore the island as well the Siesta Key Village found only a half mile north. There's so much to do and plenty of memories to make with your family. 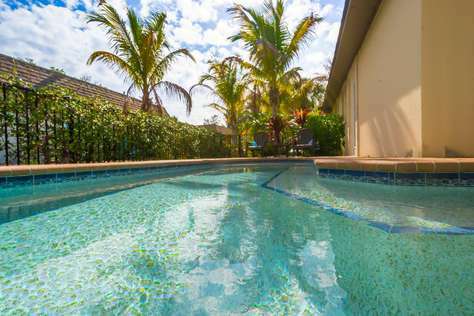 Regardless of your passion: lounging, swimming, biking, grilling, cooking, going to the beach, shopping, walking, visiting art galleries & museums, seeing live theater, etc., The Palms Cottage, along with Siesta Key and Sarasota collectively make up the finest vacation choice for you and your family and friends. Please note this property can only be rented for a minimum of 7 nights. If you have ever gone searching for the pearl of an oyster in the deep blue ocean, you will know they are truly hard to find... This unique and one of kind vacation home exudes this beauty, profoundness, and intelligence... which is what makes it so very special. If you have stumbled across The Pearl, and it has availability, aspire to truly capture this moment on Siesta Key with everything you have. The experience is worth every cent. When you hear the lapping waves of the water against your expansive sea wall... the bubbling effervescence of the heated spa spilling over into your sparkling clear blue private heated pool... fish jumping playfully through the currents beckoning you to seek after them, birds of prey dancing and singing just above you, you will realize that everything you are listening to reminds you to slow your heartbeat and your mind, and to truly learn what nature is telling you. Welcome to The Sun Dial! 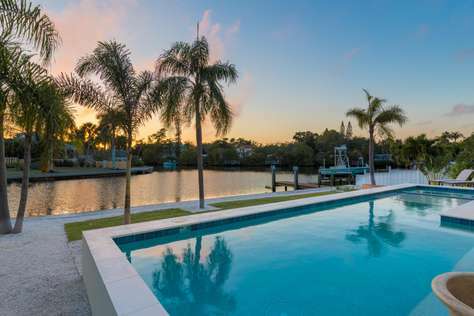 This premier canal-front home features a private heated pool with access to the Intracoastal Waterway via private boat dock and is located near Siesta Key Beach, voted the # 1 beach in the USA! This unique and one of kind vacation home exudes relaxing vibes, soft muted hues for coastal accents, and expansive garden areas overlooking a gorgeous waterway... which is what makes it so very special. If you have stumbled across The Sun Dial and it has availability, aspire to truly capture this moment on Siesta Key with everything you have. The experience is worth every cent. The Sun Dial features a gorgeous and tranquil poolside setting, with an expansive sunbathing area. There is a dock on the canal with room to fish or even just sit while watching fish jump, birds dive and hunt, and boaters passing by with friendly smiles. Lounge poolside day or night while basking in the warm Florida sun, or cozy up to the fireside on a cool winter night. Grilling will bring the family together for large feasts and you can take advantage of our always perfect weather by using the large dining room table outside under the arbor. The amenities for the poolside seem endless to include a separate pool shower and privacy fencing. Inside, the common area is sprawling and roomy, with lots of seating for everyone. The chef in the family will truly enjoy the open floorplan overlooking the outdoor area, making it a great place to host dinner parties and watch the game on the super large living room HDTV! The kitchen is first class with beautiful and plentiful cabinetry, stainless steel state-of-the-art appliances and granite counters. Lavish is the way it makes you feel when you are cooking for 12! For extra guests, we have a plush comfy sofa sleeper downstairs in the front living area (sleeps 2) while leaving the family room open for entertaining and indulgence! In total, this extremely large and expansive home sleeps 12 comfortably! Now that you have explored The Sun Dial's interiors, it's time to get out there and learn all that you can regarding our beautiful vibrant island! Siesta Key Village is only 5 minutes away. A leisure bike ride will get you there in 10 minutes. The main beach access is only 1 mile from the home and there is plenty of parking and amenities available to you and your family at the pavilion area. There will be 4 bicycles for your use as well as a couple of kayaks! There's no better way to see the entire island than to bike around town, and to explore all of the canals and waterways in the neighborhoods of Siesta Key. Just drop a kayak in and go! The experience is peaceful and yet exciting all at once! There are of course plenty of restaurants, shops and night spots. We highly recommend exploring both the north and south village of Siesta Key (Siesta Village and Crescent Village.) We also have some great day trip ideas that we love to share with our guests, so do not be afraid to call us and we can teach you more about Siesta Key! We welcome you, and we hope you fall in love with The Sun Dial and this beautiful island! Welcome to the beautiful Villa De Paradisio! This gorgeous canal-front cottage is a very luxurious and large four  bedroom canal front heated pool home with two bathrooms in approximately 1,800SF of air conditioned living space with a private heated pool overlooking the dock and canal. This home has been completely renovated and features brand new furniture, linens, kitchenware and more! There is an expansive driveway that leads to a two car garage, giving ample off street parking! Inside you will find the huge, spacious living room with lots of cozy sofas and a massive HDTV flatscreen. Just past the living room, there is a large dining room table that seats up to 10 that overlooks the lanai, swimming pool, and an absolutely brand new and expansive dock area! The entire kitchen opens out to the lanai by a pass through bar area, which makes it perfect when cooking for the family to open up the house on the cool winter nights of Siesta Key! There is a king size guest bedroom (bathroom en suite) with direct slider door access to the pool and lanai area. The bedrooms feature a variety of different sleeping arrangements, which makes it perfect for large families traveling together. One of the bedrooms has two twin beds that can be used as an additional children's bedroom or converted to a king for a couple's comfort! There is also a queen sized bed in the guest bedroom with its own direct access to the pool area. There is also a super cool bunk bed room: A true kid's haven, with custom built furniture and a bunk bed arrangement that allows for 4 twins, and a ladder to access the top bunks. This is an awesome spot for kids to hang out together and call their own space. This room is just off the second living room area near the kitchen. Also, for additional guests, there is a comfortable sofa bed sleeper in the secondary living area as well. Don't forget - TVs in EVERY room! High speed WIFI is also available in this home. The owners of this home have thought of everything! Outside, you'll find the dock, plenty of loungers for sunbathing, and a great place for fishing at night by the snook light. During the day, it's the launching site for the kayaks that are there onsite and great fun for touring the neighborhood by water. During the cool winter months, why not hop into the heated swimming pool for a nice relaxing soak while overlooking the grand canal and the beautiful night sky? If you desire to explore the island, head to the beaches or just get some exercise, plenty of beach cruisers await you in the garage. You simply will never run out of fun-filled family activities at the canal front 'Villa De Paradisio'. Siesta Key Village is just one block away. A leisure walk will get you there in 2 minutes. Plenty of restaurants, shops and night spots. Florida is known for its beaches, climate and foliage so this home features on its grounds an amazing amount of lavish tropical foliage to include many flower species as well as many fruit tree varieties. If you like plants and nature, you’ll love the grounds [almost like a botanical garden]. This is a 1 rental per 30 day period, per Sarasota, FL ordinance, contact us for more information. 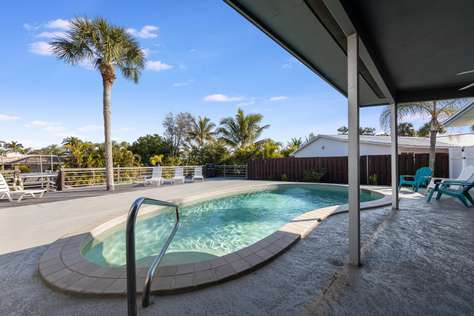 Centrally located in the heart of Sarasota, and only minutes away from our world famous Siesta Key Beach, the completely renovated Villa Trinidad offers a cool and soothing retreat with a private heated swimming pool and a spectacular view of one of the most beautiful canals off of the Sarasota Bay. Villa Trinidad is a four (4) bedroom, two (2) bath private home featuring a split plan of two bedrooms on each side of the home and a huge family area between. There are two king bedrooms, one queen bedroom, and one twin bedroom. There is also a sofa sleeper in the living room that sleeps 2! It is configured for maximum comfort and enjoyment for large families and parties who will find it a well designed retreat and haven to call your own vacation home. When its time to retire to the bedrooms, everyone enjoys their personal space with plush clean bedding, exceptional pillows, HDTV and super fast wireless high speed internet access in every room, and space for personal time and restful slumber. The bathrooms are completely updated with new cabinets, counters, plumbing and electrical fixtures and lavish towels are plentifully provided. There are lots of oversized beach towels available as well. We provide all linens as well, which as you might expect, are extremely nice. 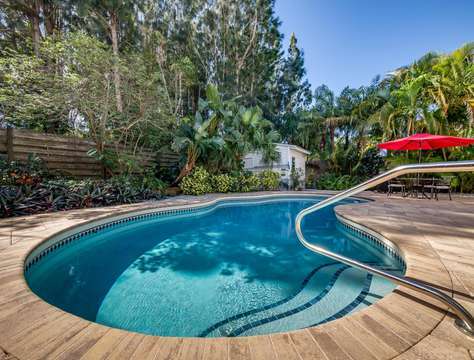 Perfect for larger families that enjoy the peaceful serenity of their own private sanctuary tucked behind lush landscaping of the old-style deep Florida woods, yet who love the closeness to not only Siesta Key, but the nightlife of Southside Business District and Downtown Sarasota. First and foremost, enjoy the benefits of your very own screened in heated swimming pool tucked into a lush garden set against the canal with a dock and a separate private fishing platform. Enjoy the gentle gulf breeze and a great view of the pool from the quaint gazebo in the garden area. This is your own little oasis, a hidden waterfront gem, with so many great things to offer everyone day and night! Villa Trinidad also features a 2 car garage, washer/dryer, outdoor grill, bikes, kayaks, boat lift, fishing gear & a corn toss game. We welcome you to Villa Trinidad and look forward to your visit! Welcome to Ocean's Edge! A massive beach-front condo located right on Siesta Beach in a newly constructed building. 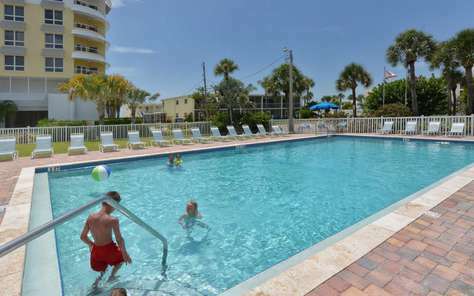 With ocean views, a heated pool, and enough room to sleep up to 8, it is the only way to experience Siesta Key! Ocean's Edge is a luxuriously appointed condo in an extremely private and exquisitely well designed condominium complex of only 6 units altogether. Unlike most condominium complexes with hundreds of units sharing one communal pool, you will have the elite status of sharing a private heated pool with only 5 other possible residents at any given time. Ocean's Edge not only has the best panoramic views of all of Siesta Beach, but it also features a decadent interior with spacious living areas, open and and inviting with endless views from the kitchens, and living areas. The 8 bedrooms are tucked privately away, each exuding the style of master suites featuring private bathrooms and king beds (sleeps 2 in each master room). There are 4 full bathrooms and 1 half bath making it ideal for your family to prepare for a night out! The home comfortably sleeps 8 with plush bedding, soft towels, and an abundance of wonderful amenities at your disposal. Ocean's Edge also has one of the finest kitchens that even a professional chef would enjoy! Fully stocked, and ready to accommodate a large gathering, the chef can partake in the festivities of the party thanks to the open and spacious floorplan, all the while guests can belly up to the kitchen bar for great conversation and libations! Top of the line stainless steel appliances, granite counters, and gorgeous and spacious cabinets reminds you that this home is nothing short of luxurious. Just downstairs (and feel free to take the stairs or your private elevator), a world of fun opens up to you and your friends and family, with the best amenities available to you as part of your stay! In the garage, you will find all the great beach gear that you need for an easy trek along your very own personal beach access to the finest and coolest powdered sand beach the world has to offer. A beach caddy that holds your chairs, towels, and cooler are standing by to make the stroll that much easier. When it's time to explore the island, why not head down to Siesta Key Village... only just a few moments away. The walk to the village is just as easy... ! It's just around the corner, and you can be there in less than 10 minutes. Also try out our free trolley service that runs from north and south on Siesta and discover all of our many beaches, the south end village, and even the bay and marina on the island! And when you've decided it's time to head back from a long day at the beach, plan your evening in by hopping in the heated swimming pool and then head upstairs to treat the family to the perfect dinner al fresco on the spacious veranda with your own gas grill and a massive dining room table that seats 12! If that's not enough, there is also an interior dining room table that also seats 12. Siesta Key Village offers the best dining and entertainment, and you're just moments away from all that makes Siesta Key fabulous! The location is perfect! The beach, the village, the views.... none of which can be beat! Welcome to your next forever vacation home, Ocean's Edge! Welcome to West Shore! A massive beach-front condo located right on Siesta Beach in a newly constructed building. 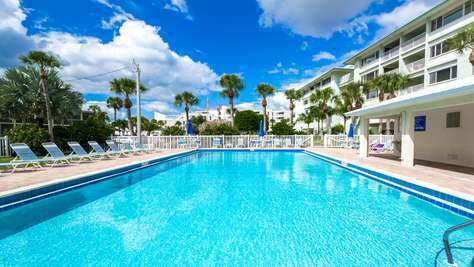 With ocean views, a heated pool, and enough room to sleep up to 8, it is the only way to experience Siesta Key! West Shore is a luxuriously appointed condo in an extremely private and exquisitely well designed condominium complex of only 6 units altogether. Unlike most condominium complexes with hundreds of units sharing one communal pool, you will have the elite status of sharing a private heated pool with only 5 other possible residents at any given time. West Shore not only has the best panoramic views of all of Siesta Key Beach, but it also features a decadent interior with spacious living areas, open and and inviting with endless views from the kitchens, and living areas. The 4 bedrooms are tucked privately away, each exuding the style of master suites featuring private bathrooms and king beds (sleeps 2 in each master room). There are 4 full bathrooms and 1 half bath making it ideal for your family to prepare for a night out! The home comfortably sleeps 8 with plush bedding, soft towels, and an abundance of wonderful amenities at your disposal. West Shore also has one of the finest kitchens that even a professional chef would enjoy! Fully stocked, and ready to accommodate a large gathering, the chef can partake in the festivities of the party thanks to the open and spacious floor plan, all the while guests can belly up to the kitchen bar for great conversation and libations! Top of the line stainless steel appliances, granite counters, and gorgeous and spacious cabinets reminds you that this home is nothing short of luxurious. Siesta Key Village offers the best dining and entertainment, and you're just moments away from all that makes Siesta Key fabulous! The location is perfect! The beach, the village, the views.... none of which can be beat! Welcome to your next forever vacation home, West Shore!